Yesterday’s battle against the elements seemed as if it were months ago. The sun was struggling into the clear morning sky of an Icelandic winter, as if straining against the horizon’s short leash. Our car, essentially alone, was weaving in and out of the splayed fingers of the spectacular eastern fjords, stopping frequently as each turn revealed yet another majestic view. A light breeze was moving a fine layer of snow in pleasant swirling patterns across a road patched with ice. Even when we encountered the occasional, brief snow squall of a fjord’s microclimate, it did nothing to dampen our relaxed and jovial mood. Today’s goal was to reach the Mývatn region in the country’s north, where we anticipated spending a few days exploring the local sights and perhaps enjoying a quick soak in the nearby steam baths. We had made good time and the weather was still in a largely cooperative mood as we left Egilsstaðir, so I confidently predicted we would reach Mývatn – approximately 100 miles to the west – in a couple of hours. Twenty minutes later, my confidence – together with the promise of a relaxing hot bath under the stars – had been brutally blown away by a vicious blizzard. We slowed to a crawl as we navigated through the ferocious conditions and renewed our acquaintance with Iceland’s yellow roadside poles; gratefully greeting each one as if it were a fearless rescuer. Shortly, moving with the speed of a clock’s hour hand, red taillights appeared ahead of us. As we followed them through the whiteout conditions, its brake lights flickered like a strobe under its driver’s terrified right foot. And then it came to an abrupt stop. With this act, the driver set off a chain reaction among the convoy of vehicles that had accumulated behind him. Among them, and invisible until the very last moment, a 22-wheel truck was now sliding downhill on the packed ice, straight towards us. It finally skidded to a stop six inches from the side of our car and, with surgical precision, succeeded in removing only the cover from the driver’s side wing mirror. There was no other damage. Resuming our journey after that brush with catastrophe, any hope that the worst was now behind us was woefully misplaced. We were soon driving through the plot of an implausible disaster movie. There was a bus with its entire front window smashed in, listing slightly to one side but with no indication of what had caused its fate. By the roadside, in various states of distress, at least a dozen cars were abandoned. In a moment of comic relief, a surprised head suddenly popped out of the window of one of the cars as rescuers struggled towards him. Laying on its side another 22-wheel truck was gradually disappearing beneath the blizzard’s onslaught. A snowplow – yes, a snowplow – stood idle at the roadside, appearing to wear the solemn expression of recent defeat. Flashing blue lights bounced off of the driving snow as a convoy of rescue vehicles rushed in the opposite direction. Had we been able to see any farther than twenty feet in any direction, we would have also seen our plans for the next few days cartwheeling violently away into the distance. Eventually, with equal parts incredulity and relief, we arrived at Mývatn and found a room for the night. The receptionist greeted us warmly, but with an expression that barely masked her surprise at seeing any guests at all. 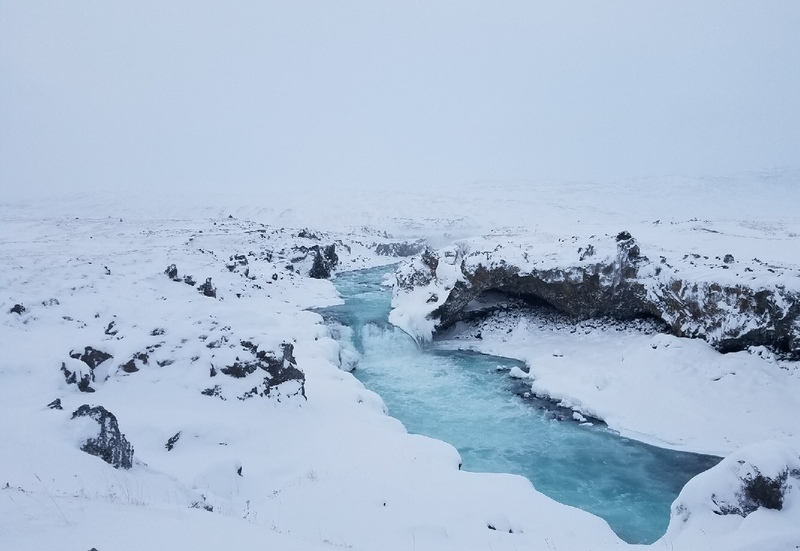 She quickly turned to her computer monitor (which was, as is legally required in Iceland, displaying the IRCA website – http://road.is) and confirmed to us that, for the second time in two days, the road we had just been on was now indicated in “impassable” red. Having overcome her initial shock of seeing us in the first place, she inquired about our travel plans for the next day. “We’re heading to Akureyri”, I said. After taking a moment to compose herself, and adopting the persona of a veteran weather forecaster, she then proceeded to announce tomorrow’s expected conditions. “Winds will be equally severe tomorrow, reaching speeds of up to 40 metres per second and heavy snow will start falling across the entire area by early afternoon. All roads are expected to be impassable by 3:00pm and will not be open again until Saturday, at the earliest,” she said. Today was Wednesday. There may never have been a more accurate weather forecast. With these warnings fresh in our minds, the next morning greeted us with conditions that had calmed sufficiently to permit a brief visit to the jagged lava pillars at Dimmubogir, where we blazed a trail through fresh, knee-high snow. All the while we were keeping one eye on the surreal landscape and one on the time. After a stop at the Godafoss waterfall, which turned in seconds from a pleasant winter’s afternoon to a blizzard whose ice pellets threatened to tear the skin off of our faces, followed by a sliding rollercoaster ride of a drive down the eastern side of the Eyjafjördur, the lights of Akureyri greeted us shortly before 2:30pm. Thirty minutes later, the roads to the east and west of the town were closed. We were stuck. There is a refreshing sense of calm that descends upon me when travel plans are thwarted by immovable obstacles. Accepting there’s nothing I can do, I tend to relax into the new reality. Once the inconvenience of changing reservations has been dispensed with, unanticipated experience awaits. And, as we were about to discover, if you’re going to be stuck anywhere in Iceland, Akureyri isn’t a bad place for that to happen. Iceland’s second city – a place of less than 20,000 residents – has a warm and inviting personality. 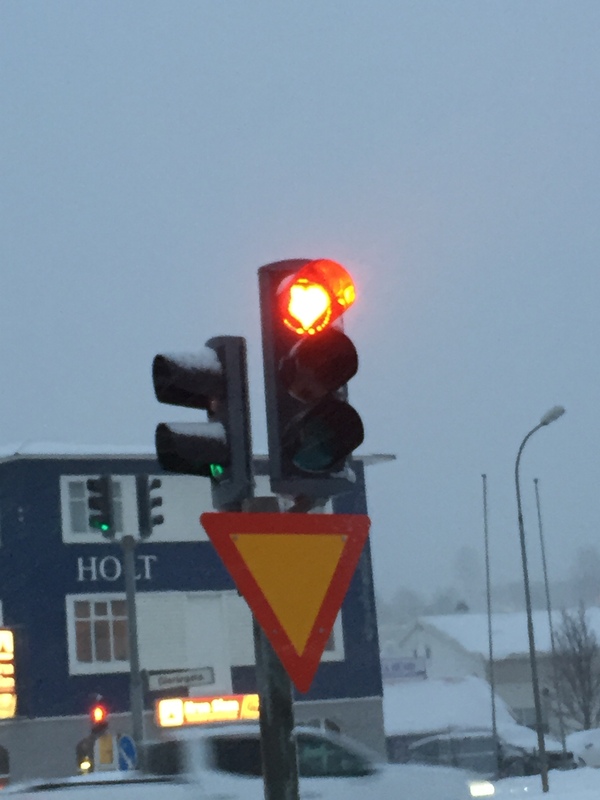 Even the traffic lights are friendly; with their red heart shapes politely suggesting that you pause your journey for a moment. Shortly after our arrival, we were neck deep in the heated pools of the Sundlaug Akureyrar (the city’s main public swimming pool). Our bodies were warm, our faces were being pinpricked by an icy, swirling snow, and a recently constructed snowman was watching over us from a lifeguard’s chair. It was a little weird. We dined at the Strikið restaurant, devouring their exceptional food and consuming cocktails as if they were about to be banned. The next day, we braved the irrepressible storm to wander the fjord’s edge and its collection of sculptures. We shopped. And, on a whim, we popped into the Akureyri Backpackers bar for a quick drink. Well, one of them may have been quick. We struck up a conversation with Mar, a local tour guide, who earlier that day had tried (and failed) to pass the physical test to join the Icelandic police force. To add insult to his injury, the event had been broadcast live by a national news channel, forever memorializing his performance. With a combination of rudimentary words and hand gestures, we discussed the finer points of the boxing match playing out on the big screen with Beni, an unemployed Albanian migrant. Isak, from Sweden, his initial reticence forgotten, talked in animated terms of the horrors of mass tourism and his quest to uncover the unique experience. 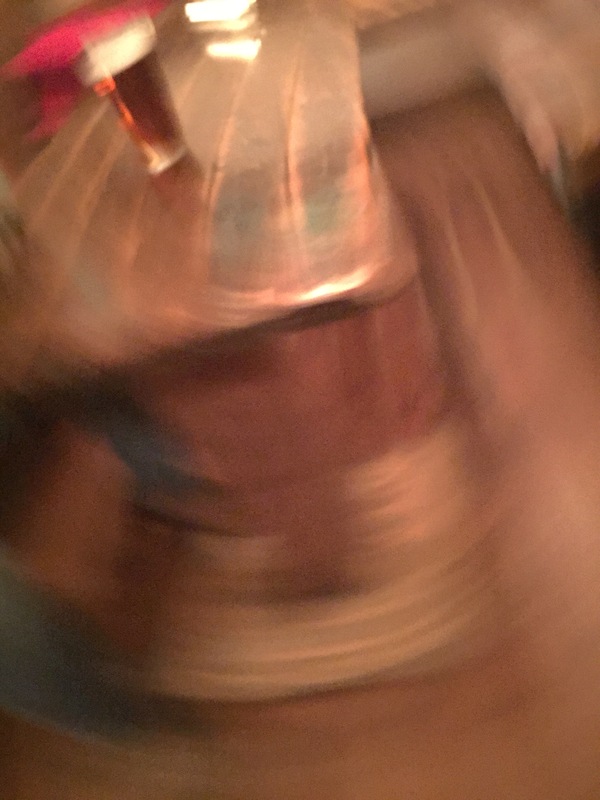 He then returned to the contemplation of his beer, no doubt planning his circuitous route around humanity. And a group of Poles and Russians – their capacity for dialogue destroyed by drinking that really should have stopped six hours before – insisted we accompany them to a local nightclub. On Saturday morning, the roads out of Akureyri opened under clear blue skies. The contrast with the previous few days could not have been starker. Behind us lay a trail of places unseen, plans frustrated, and disasters averted. But that wasn’t the story. It was a story of the haphazard forces of chance, luck, and nature colluding to throw us off course. Yet, for each impassable road, another invited our exploration. For each elusive destination, an enticing one awaited. And for the missed flights home, there was a night spent in the company of people we will never see again but likely will never forget. And it all happened in the space of four days. And this is why we travel. This is amazing! Thank you for sharing. I will not be wishing to experience it for myself!